The holiday Soirée is fast approaching! All students should be considering the piece they would like to perform at the Soirée. The ukulele and guitar players know their plans so I would like the pianists and singers to talk to me about their selections. I would love to have any original compositions but I do want these to be on manuscript paper although you can certainly play from memory. For new students, the Soirée is my name for my twice yearly student recitals. 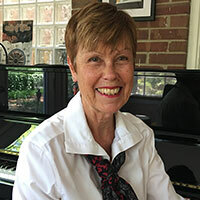 But I want to emphasize that these are very relaxed occasions and I always sit at the piano with the younger students. It is more like playing for friends. Some of my adults take the opportunity to work on their repertoire but performing is not mandatory, just encouraged. The Soirées are held at Croasdaile Village community in the Auditorium, Sunday December 2 from 3-5 pm. Even if you are not performing please come and support the students who are. Many members of the community enjoy coming to the soirees and it is so good to see the generations together. I would like to have the Soirée program all set before thanksgiving. The Playathon: I have some students willing to come and perform Saturday October 19 at Northgate Mall from 2-2:30 pm. There is certainly room for more performers and I will be asking students this week if they are willing to come and support the Durham Music Teachers Association, who are raising money to fund scholarships for students who cannot otherwise afford music lessons. 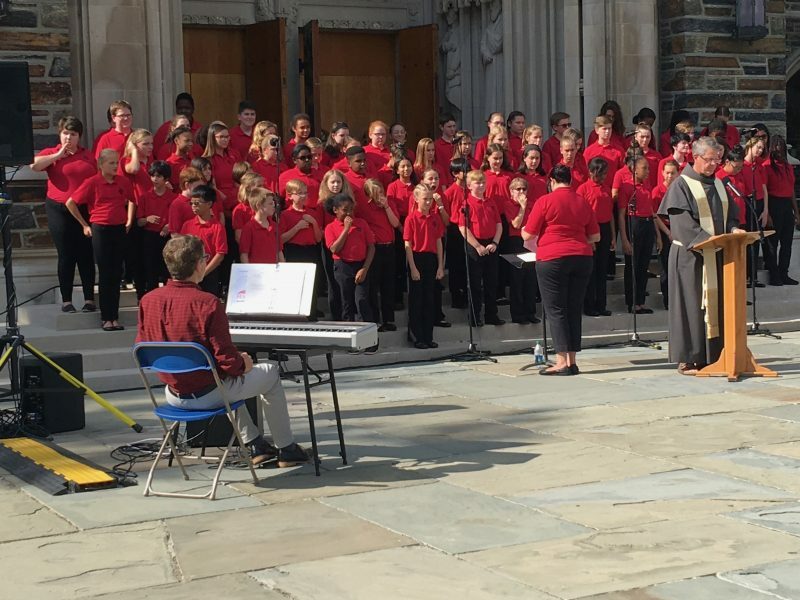 Congratulations to two students who sang with the Durham Children’s Choir at the St Francis day Blessing of the Animals at Duke Chapel. You can just see Mia Pieraccini in the back row and Lucas Bartosic in the front. Singing in a choir is one of the best ways to safely exercise a young voice. In addition to the twice yearly Soirées, I also host adult work-in-progress nights at my house. I had hoped to have one in October but all kinds of things intervened and now I hope to have one before thankgiving and the suggested date is Friday November 16 (thanksgiving is awfully early this year!). Can adult students check their diaries please? These are very relaxed occasions with adult beverages and nibbles. The emphasis is on the in-progress art. I have had several people ask if I take credit card or paypal for the fees. I really prefer checks but I know paying by check is something which is going out of style. I can accept paypal payments but only if they come from a debit account, otherwise I am charged fees and I try to keep my students fees as low as I can. I am not able to accept credit cards for two reasons: the fees credit card companies charge and the time it takes from lesson time to process the payments. So I am sorry but I hope everyone can continue to pay me by check! You can also pay by cash and if you do, please put it in an envelope with your student’s name. Fees are due at the beginning of the month and most people are really good about that and I thank you. You can always see what you owe at the bottom of your weekly student email. Thanks always for learning music with Flourishing Muse Studio. These awards are an exceptional distinction and are the result of the invaluable support and inspiration that you provide! All student awards will be sent by early January. Should you have any questions, please do not hesitate to contact us. Thank you for participating in The Royal Conservatory Certificate Program and congratulations once again for this outstanding achievement! August is rolling through! It is good to be having some students already coming back to lessons. Even though I have numerous of projects on the go, I love to see my students and enjoy the interactions with them so much. “They” say extroverts get their energy from being with people and there is definitely a large part of me that is like that. (Introverts apparently get their energy renewed by alone time, and I can appreciate that too at times). I am working on solidifying the date for the Holiday Soiree – Sunday December 2 from 3-5 pm. Fall semester is quite short so I will be working on the programing from September onwards. Fall semester officially begins Tuesday September 4, the day after labor day. For all students who will not have started lessons in August, their lessons will commence on that day. Sorry about Labor Monday students – if a Monday student wants a lesson that week let me know and I might be able to fit them in. Don’t forget I am having my summer beach week, last vacation of the year, from Monday 8/27/18 to friday 8/31/18. “So why upgrade? Longer keys mean better balance from front to back of the piano keys. The rotational inertia gives dynamic touch changing the feel as you play soft to loud. And finally, the spring loaded joints aid the reset. All of these work collectively to define the touch of a piano. When you compare that to a digital piano where the touch weight is simply raising or lowering a lead weight on a see-saw, the difference is significant. In addition to these touch elements, traditional pianos also have adjustable parts to refine the touch components as well. Final considerations regarding touch: dexterity and injury. After nearly 30 years of teaching, I could tell as soon as I heard a student who had been practicing on a digital piano. How? They have not developed anywhere near the right amount of finger dexterity. You can “hear” that their technique is weak. Dynamic touch brings about correct dexterity. You can especially hear it on quick staccato passages. But the more important consideration is injury. Extended practice time on digital pianos have the propensity towards injury. I’m not a kinesiologist but I think it has something to do with repetitive loud playing on the digital piano. I believe that the force is somehow not absorbed the same way because digital pianos do not have dynamic key weight. When you come crashing down on the keys, if the static weight doesn’t change, the next absorption point is the hands and arms. The dynamic nature of the acoustic piano changes the resistance when you play and for whatever reason, I find it more forgiving. When it comes to upgrading from a digital piano to an acoustic piano, there are also 2 sound concepts to be mindful of: The first is the continuous flow of sound which we commonly refer to as analog. The second is dynamic timbre referring to how the sound quality changes with dynamics and volume. I know finance is the problem for so many people and pianos are expensive, but a pianist told me that the Trosa Thrift Store on North Roxboro Street often has numerous pianos in quite reasonable condition. You would need to have someone look them over for weak points but it could be a good starting place to acquire an acoustic piano. Pianos do need to be tuned at least once a year and the fees are somewhere around $140 for basic tuning. Happy late summer everyone and be safe.